"New and Improved, washes even whiter"
It’s every ad man’s dream that we believe that strap line. Whether it’s detergent, cars or software, we are endlessly under pressure to upgrade to the latest all-singing all-dancing version of whatever, or our lives are somehow meaningless. Fortunately I’m long enough in the tooth that most of this stuff now washes over me, but even I have my weaknesses. There is now an all new Porsche Cayman! OK, my cards on the table. After a string of second hand Porsches, and a lot of soul searching, I took delivery in Nov 2006 of my first ever brand spanking new Porsche. 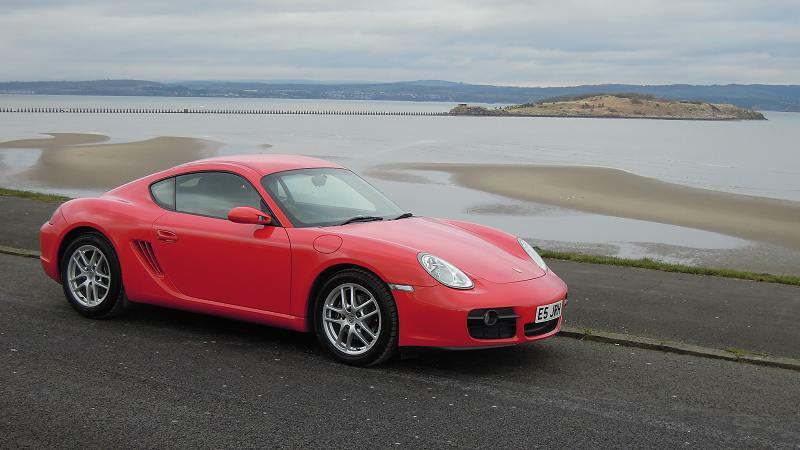 A Guards Red 2.7 Cayman, one of the very first off the transporter in Scotland. It is possibly the most basic car they have yet made, as all I specced on it were heated seats and cruise control; nothing else. No leather, no big wheels, no sat nav, no trick suspension. All I wanted was the car, not the gee-gaws. From the first few miles I knew I’d done the right thing, the car fitted me like a hand sewn glove, driving it felt so natural it was like I had the palms of my hands touching the road surface. It is not the fastest car that Porsche makes, indeed far from it, but it has always felt to me to be the closest to their original ethos of being fast by dint of being light and agile, rather than packing huge firepower. In this regard, I consider it to be the most "Porsche-like" car in the current Porsche repertoire. For the last 6 and a bit years and over 50,000 miles, it has been a totally faithful friend. Every mile in it has been a privilege, and to date nothing, but nothing, has tempted me to part with it. But now there is an all new Cayman, and I’ve got the keys. When I first saw the 981 Boxster, my impression was how much bigger and more bloated-looking it seemed, compared to the outgoing 987 version, so I have mentally prejudiced myself for the same to apply with the new Cayman. Parked side by side, I’m dumfounded to see that in fact it is my older car which looks the bigger of the two, but how can this be as the statistics clearly say otherwise? I circle the two cars studying each line and the subtlety with which Porsche has re-styled the car slowly becomes apparent. The wheelbase is longer, the overhangs tighter, the flanks more sculpted; these are all pretty obvious, but it is the cabin where the real magic has taken place. The roofline is lower, the front windscreen is shallower and steeper with noticeably more tumblehome, the small rear side windows are longer, the rear glass is deeper and the tailgate stands prouder. It loses some of the delicacy of the old design, but there is equally no denying that it is one very handsome car. My test car is wearing a rather blingy set of 20-inch wheels. I’m no fan of huge wheels, although I’ll grant that the new car wears them better than the old design did, as I always thought it could easily look swamped by the larger wheel choices. Unlike my car, the test car is absolutely dripping with expensive options … PDK, paddle shifters, PASM, leather, sat nav, fancy hi-fi, parking sensors, and heaven knows what else. It’s a long way from my ideal spec, but let’s drive. I’m always amazed at how much you learn about a car in just the first half mile, and before I’m even out of the trading estate and onto the main road several key things emerge. First the ride has been transformed. If the original Cayman has a glaring fault it is the very brittle and uncomfortable low speed ride. This gets ever more excruciating as our local authorities seem now to have decided that leaving our cratered, crumbling, pot-holed roads alone is their maintenance programme of choice, and are spending all the money on more speed cameras and flashing signs instead. The new Cayman treats this road mayhem with disdain, easing over the lumps with a silky, damped poise that is unknown to my car. I may like my sports cars simple, but I still like them comfortable, so the first point goes to the new car. Then the steering makes its presence felt. Ah yes, the much discussed electric steering. I had already decided I was not going to join all the other sheep-like motoring journalists by bleating on about the steering, but it is true. The new system has a distinctly different feel from the old one. Again it has a silken, damped feel to it, but it has a certain deadness too, although I confess that as the day wears on I acclimatise to it. What I most certainly do not acclimatise to is the truly horrid steering wheel. It is the paddle shift "sport" version, with the silver spokes, which even have illuminated signs in them for heaven’s sake! It is too small in diameter, too thick in rim, and burdened with uncomfortable lumpy hand indentations. It is frankly an abomination, and is I suspect as much a culprit in the change to the steering feel as the change from hydraulic to electric assistance. Traditional Porsche steering wheels were always slightly larger and thinner than the competition, and were another indicator of "Porscheness", whereas this wheel belongs firmly on a BMW. Nuff said. I am also quickly reminded that I simply don’t get on with PDK, at least not in a sports car. I know it’s efficient, and gets you round the blasted Nurburgring a second faster (as if that counted for anything back here in the real world) but on a high-revving, relatively low-torque engine, it just feels all wrong. 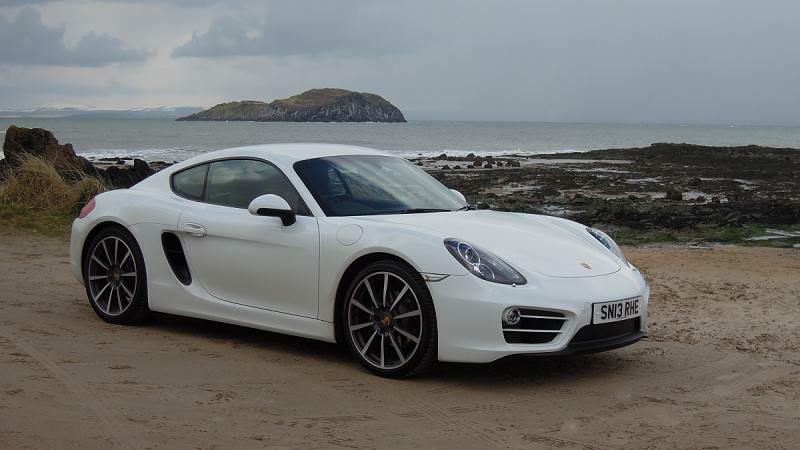 Last week I had the pleasure of three days in a diesel Panamera which had the most blissfully well-matched auto box and engine, I would not have contemplated any other choice, because the whole set up matched the vibe of the car. I can’t say I feel the same for the PDK set up in the Cayman. Again, by the end of the day I was slowly getting to grips with it, but I yearn to try a manual version. And while I’m in a moaning mood, there is too much polished metal brightwork trim in the cabin and on the dashboard for my taste. It looks too much like an Audi for my liking: can I have it toned down a bit, please? 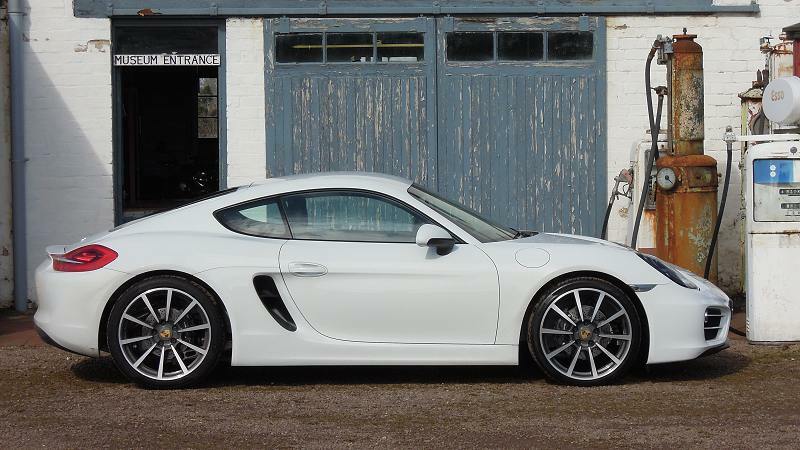 And that, you will be pleased to hear, is pretty much all I can find to say about the new Cayman that I don’t like. In every other respect, this is a truly stunning car, and all those 5-star reviews that you have been reading in the magazines are spot on the money. I had borrowed the car for the day from the ever-helpful Porsche Centre Edinburgh, and was winding my way down the East Lothian coastline, stopping to take photographs in the arctic conditions, but enjoying the changing light. I pulled into the tiny Myreton Motor Museum, been meaning to go for years, and it provides a nice photo backdrop. The journey down to Gullane for lunch was pretty slow with traffic, so I just ambled along, which allowed me to appreciate just how comfortable the car is. The seats are damned near perfect, but so too are the driving position and the control layout. View out is excellent, mirrors are good, and you rapidly build confidence in placing the car, as praise be it has not put on any significant girth. Build quality is fantastic, clever detailing, doors shut with a satisfying thunk, boot space back and front makes it a truly useable two seater, which is more than you can say for some of the competition. Take note Lotus, Alfa and others; these things count every bit as much as spiffing handling and snazzy looks when it comes to parting with a serious chunk of cash. Next to North Berwick where I contract hypothermia taking some rather nice pics of the car on the beach with the Bass Rock in the background, before seeking out some more deserted back roads to give the car a bit of a workout. This is the basic Cayman with a mere 275 bhp, and as any bar room pundit will tell you, that is a pathetic power output, suitable only these days for a Renault hot hatch. Real men need a GT3 and 450 bhp at the very least, and even the Cayman S with 325 bhp is really only a girl’s car. This is, of course, complete nonsense, stoked by the Devil’s triumvirate of BMW, Audi and Mercedes with their utterly pointless (but oh so macho) 600 bhp estate car offerings. Let me remind you that the original, pre-varioram 993 Carrera had 275 bhp, and I don’t recall that being thought of as slow. 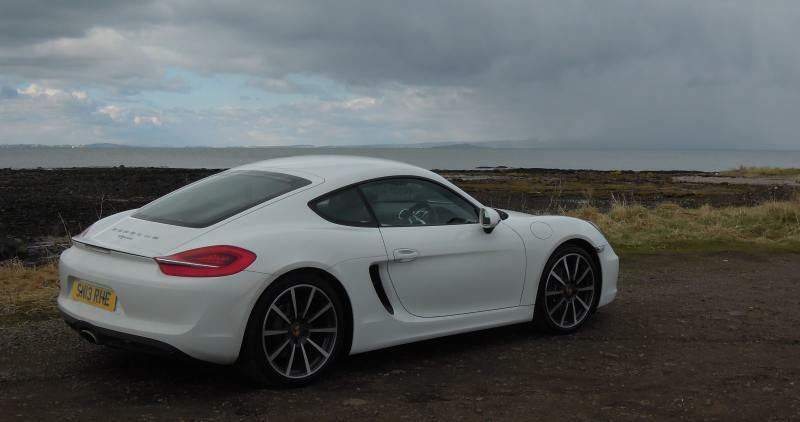 The truth is that the Cayman can outpace the rural back roads of East Lothian by some margin, and quite why you would need anything faster for real world motoring is beyond me. I could of course now take the empty, sweeping A1 dual carriageway back to Edinburgh and test the maximum speed, but as there are Gatsos every 5 miles, my licence wouldn’t make it back to the showroom. Isn’t this a wonderful country? I simply do not understand why people buy cars with such pointless power outputs these days (other than to brag, or drive in silly circles round Knockhill perhaps) so let me assure you that the even the basic Cayman is way faster than you can use on the road. Driven with gusto on iffy roads, I notice something important about the steering though. The old hydraulic system had oodles of feedback it’s true, but add feedback, wide tyres and rutted roads together and you could often get a car that could be a tad unruly. Not as bad as my old 964 admittedly, which followed cambers and lines with the enthusiasm of a truffle hound, but you get the picture. This car is running very wide 235 front tyres, with the profile of a rubber band, yet there is not a hint of tramlining. If it exists, the steering is filtering it away from the driver and giving you only the information you need, and none of the distractions of running wide front rubber. Thus can you exploit the formidable grip on offer and cover the ground rapidly feeling very unruffled indeed. You know, it’s maybe even just possible that the Porsche steering engineers might actually know more about this stuff than Steve Autocar and Harry Evo after all! Rest assured that if you buy a Cayman, you are unlikely to ask for a refund on the grounds of poor handling and low grip. And so I cruise back to Edinburgh along the deserted A1, at a tad over 70 mph to avoid becoming another criminal statistic. The real criminal statistic is, of course, driving a car of this utter competence at such a laughably low speed in perfect conditions, but someone other than me apparently knows better. (Yeah, right). I do however notice that the car is so high-geared it seems to be doing only about 2,000 rpm at this speed, and if I lift off even slightly it goes into "sailing" mode, where the engine disconnects and drops to 600 rpm, and the car coasts. Weird at first, but like so much of the new and unfamiliar technology on this car you get used to it surprisingly quickly. 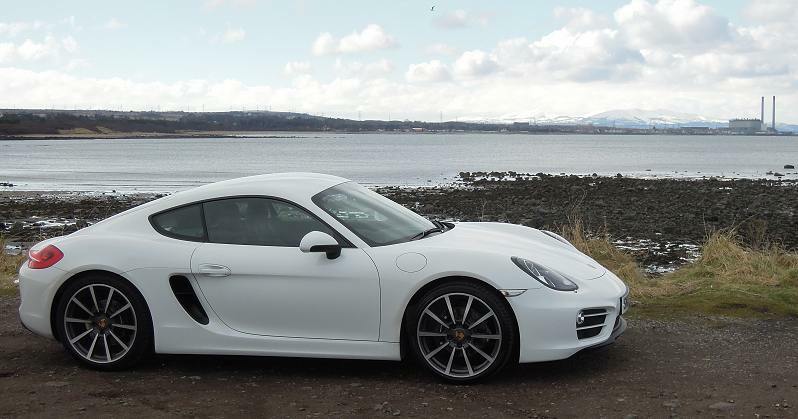 I return the car to Porsche Centre Edinburgh with the usual thanks and pleasantries, and go to retrieve my own Cayman with some trepidation. After all, the new one I have just spent all day in is such a masterclass in how to make the perfect sports car that mine is bound to feel old, tired and inadequate. Porsche’s marketing department will certainly be hoping so. They are, however going to be disappointed, ‘cos rather to my surprise, my old faithful still feels remarkably good. The cabin is more restrained, but frankly no less comfortable. The exhaust note is very similar, and all the controls feel just a little bit more tactile, a bit less damped (yup, damped is the word that sums up the difference). Best of all, mine has that deliciously slim steering wheel rim, and the whole car feels agile, light on its feet, and eager to go. I drive home a happy man. I’ve beaten the ad man! 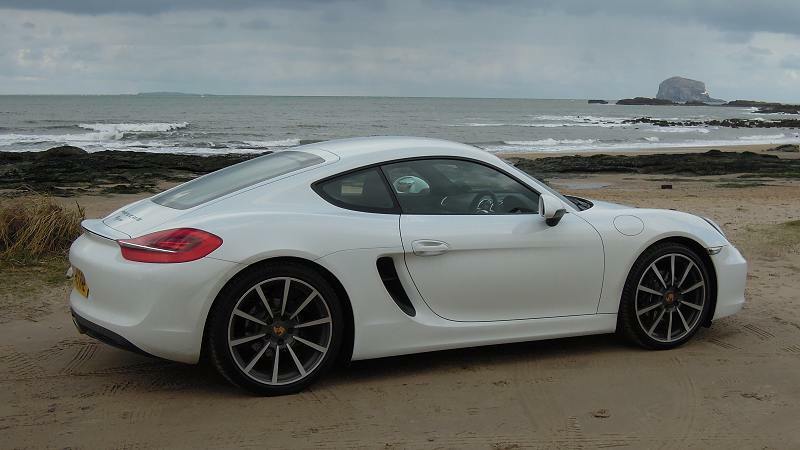 So the question is … should you buy a new 981 Cayman? If you can afford the ticket, unquestionably yes. It is quite simply the best car Porsche make, and as Porsche arguably makes the best cars you can buy … well draw your own conclusion. Personally, I’d say the sweet spot is a lightly-specced 2.7 car at around 40 grand-ish, but if it floats your boat you can easily double that by going for the S version and ticking all the expensive options (and yes, I’ve tried it on the configurator). But don’t despair if you can’t run to these sums of money. There is a plentiful supply of the original Cayman out there at a fraction of these prices, and today has proven to me that they are still fantastic cars. The new version may be new, improved and wash even whiter, but the truth is there was never much wrong with it before they started … despite what they would now like you to believe.